Photo via Stoneleigh-Burnham Equestrian Center on Facebook. Area I has seen its fair share of calendar changes over the course of its existence and sadly we now say goodbye to another beloved event. Stoneleigh-Burnham School (SBS) Equestrian Director George Halkett announced today that SBS will no longer host USEA recognized horse trials. The school will continue to hold schooling horse trials throughout the year, and their courses and facilities will continue to be utilized by the active equestrian program offered by the school. Stoneleigh-Burnham School is a boarding and day school for girls settled on a 100-acre campus in Greenfield, Massachusetts. The school’s formation dates back to 1869 and the first horse trials at SBS were held in the 1960s when Denny Emerson’s father served as headmaster of the school. In recent history SBS has hosted two USEA horse trials per year, one in July and the other in October, in addition to numerous schooling events. SBS was the oldest still-running sanctioned horse trials in Area I. “After much consideration, USEA recognized horse trials will no longer be hosted at the SBS Equestrian Center. ​We have enjoyed being an eventing site, but find it necessary to dedicate our resources​ to more student-focused programming,” said George Halkett in a USEA press release. This is the second venue loss of a USEA event for Area I within the past eight months. After purchasing the property and attempting to take up the mantle of King Oak Farm after its sale, Grindstone Mountain Farm announced in December that it would no longer hold recognized horse trials in 2018. 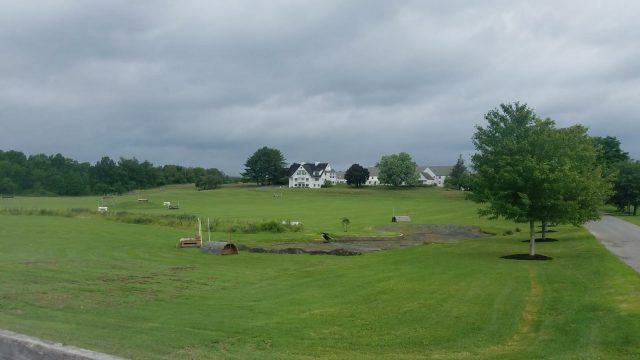 Though we are saddened to lose this beautiful venue from the USEA calendar, we are grateful to the many years of hard work put in by Stoneleigh-Burnham School and its organizers and volunteers to host horse trials over the years. Do you have fond memories of galloping across the SBS campus, EN? Share them in the comments!